Chandigarh : Punjab Chief Minister Parkash Singh Badal on Sunday said he was "overwhelmed with feelings of boundless humility" at being chosen for this year's Padma Vibhushan, the second highest civilian honour of the country. The chief minster dedicated the award to "millions of humble and hardworking people toiling in farms, shops, offices and homes in villages and cities to make India a better place to live in." Calling this an honour bestowed on the people of Punjab, Badal said, "This is an honour bestowed on the proud and patriotic people of Punjab who have always braved heavy odds to remain sword arm and the breadwinners for their fellow countrymen." "I owe this honour to countless of those selfless people who have always showered unquestioning love and trust on me in our shared quest for a better future for generations to come," he said. The chief minister said that this honour will fill him with even greater humility and determination to continue to work for the uplift of the people, especially the poor and the downtrodden and the hard-earned atmosphere of peace and communal harmony in the state. I rededicate myself to the task of greater glory for my state Punjab and the country, he said. Meanwhile, Punjab Deputy Chief Minister Sukhbir Singh Badal said the Padma Vibhushan bestowed on the chief minister was a testament of "clean and vendetta free politics". 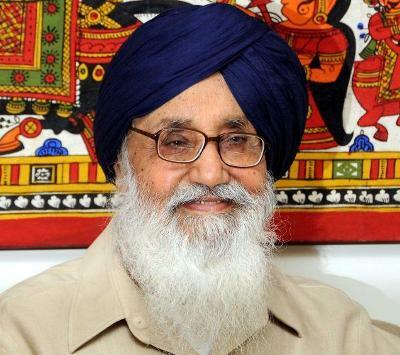 The award also recognised the fact that Badal had led a selfless and blemish-free public life which was an example for others to emulate, he said in a statement here. "It is also a recognition of the struggles launched by Badal for various causes of Punjabis as well as his ability to take each and every section of society with him", the Deputy Chief Minister said. He said as a son he was profoundly happy that his father's long innings in public life had got due recognition it deserved at the national level. "Whatever I have learnt is due to my father. He is a PhD in not only politics but life itself. I have been fortunate to be by his side and inculcate life habits which have gone a long way in making me what I am today," he said.